Bible Study is offered every Wednesday evening in the Fellowship Hall for all interested individuals. Starting with a potluck meal at 5:55 pm, it moves into a lively scripturally-based discussion until 7:15. Once a quarter this group has a movie night and spends the next two weeks examining the movie scriptureally. All are welcome! The General Commission on United Methodist Men involves men in a growing relationship to Jesus Christ and his church and provides resources and support for programs of evangelism, stewardship and the needs of men. United Methodist Women is a faith-based membership organization of women within the United Methodist Church. Members are committed to growing as disciples of Jesus Christ in community with other women and advocating on behalf of women, children and youth around the world. The Men's Bible study is made up of mostly working men who find it hard to fit a Bible study into their lives. They meet in Baton Rouge on Thursday mornings at 6 am for coffee and join together in a Bible study. "Touching All Generations" is a group of women from 20's to 60's who enjoy each other's company. This program, based on scripture and how it touches our lives, allows them to offer moral and spiritual support to each other. They meet on Tuesday evenings at 7:30 pm . See Judy Gilmore for more information. Tuesday are special days in the Faith Crossing Fellowship Hall. Each week from 10 am - 3:30 pm (subject to change) some very talented and renowned local artists come together to talk, share ideas and work on their respective artistic endeavors. Just bring your own project and supplies and spend some exciting-yet-relaxing time in an encouraging and comfotable setting. It's free and open to anyone who has an interest in expanding their artistic experience. The Run for God is a small group that meets every week in the fall for a devotion and exercise. 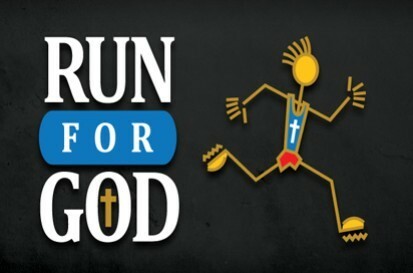 The Run for God Challenge is a 12-week Bible study program that allows runners to combine faith and endurance training in a way that helps take people, even those whose never run, through their first 5K.